U-ZC-S Filter can quickly remove impurities from the surface of filtering screens, thus removing more impurities with high efficiency. It applies to the filtration of water and various low viscous liquids. U-ZC-S filter always keeps the filter element clean by its advanced self-cleaning mode, and discharge the waste liquid containing high concentration impurities to reduce material waste. It is more obvious efficient to filter water with poor quality and low viscosity liquid . 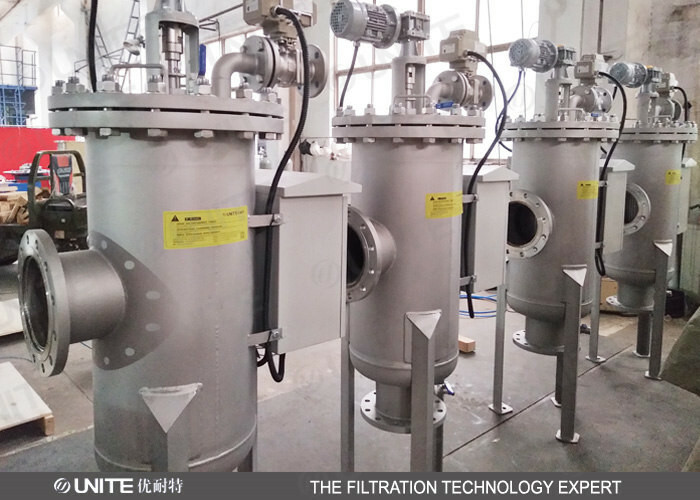 U-ZC-S Filter with notable technical advantages and low operation costs, it has gradually displaced the traditional manual filters in various fields, such as vibrating-screen filters, bag filters, basket filters, etc. Raw water enters the inside of the screen-cylinder from the filter’s Inlet and flows through the screen to the filter’s Outlet. The dirt particles are trapped on the inner screen surface and formulate a “filtration cake” that causes a differential pressure across the screen. A pressure differential switch senses the pressure differential and when it reaches the pre-set value, the cleaning process begins. During the self cleaning process, filtered process water continues to flow. The Drain Valve opens and the Motor rotates the stainless steel brush which sweeps the inner surface of the cylindrical screen. The particles trapped on the screen are dislodged by the brushes and flushed out the drain valve. The whole process takes 20-30 seconds. During the whole process water supply is uninterrupted.